Want to know the power of the car community here in the Twin Cities? Last weekend at the 20th All-Mitsubishi Cookout and Car Show, held in Ramsey – northwest of Minneapolis – a big surprise was about to spring on its organizer Curtis Gendron. Think about it: twenty years! 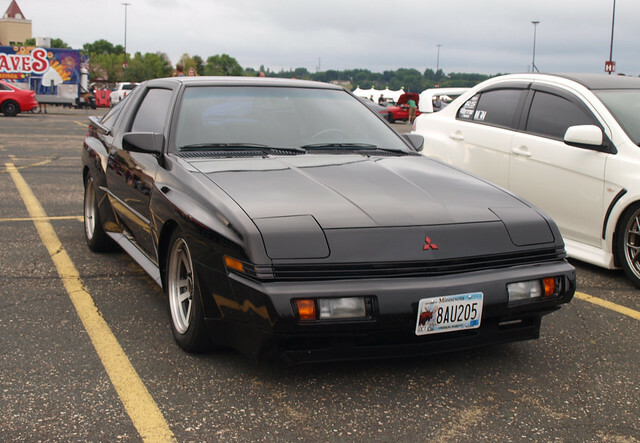 This event brought Mitsubishi enthusiasts from the Twin Cities and beyond. Dozens of Mitsubishis and Chrysler Corporation captive imports came together in what has become a well-established tradition to celebrate a brand and company with a deep community and enthusiasm befitting of its products. The Diamond Star cars, the high-powered 3000 GT, and its Dodge brother, along with various models across all decades, are just the focal point of this event. It is also the people – and the community did come out for one special occasion. How did this come about? Gendron’s friend and fellow enthusiast Collin Resch came up with a plan to celebrate the 20th Cookout and Show by presenting Gendron with a very special Mitsubishi – a 1987 Starion ESI-R. Resch got help from the Minnesota Car Enthusiasts Club – in particular, Daniel Balto – to create a fundraiser to help pay for the Starion. This project was called “Operation Secret Starion.” It was the best-kept secret in the state of Minnesota. As you can see from the video, Gendron and his wife were very surprised. It was indeed an honor for Gendron to be presented with this special gift of Mitsubishi’s own North American and global history. It would make a great addition to his collection. The Starion coupe was one of the first models sold by Mitsubishi Motors of North America in 1982 when they established their own dealership network on the West Coast. This sports coupe was Mitsubishi’s answer to the Mazda RX-7, Datsun 280ZX, Toyota Celica Supra, Porsche 944, and other rivals. The two-seat, turbocharged sports coupe became a player for enthusiasts looking for something different to chuck around canyon roads and the track. The Starion became the brand’s halo model in its early years in North America, only to be superseded by the 3000GT in the 1990s.